The Salvatore family welcomes you to Western New York’s Premier Boutique Hotel. Designed for comfort, The Delavan has 60 elegantly appointed, luxury rooms and suites, large hallways and a spacious lobby. Amenities include a full spa from the award winning Capello’s Salon and Day Spa, offering hair, manicure and pedicure services, a fitness center, and the newest in integrated electronic technology. The Delavan is perfect for Bridal parties, business travelers, and couples looking for a romantic getaway. The Delavan Hotel & Spa is conveniently located on The Salvatore’s Hospitality Campus that also includes Salvatore’s Italian Gardens Restaurant, The Chandelier Bar, and Salvatore’s Grand Ballrooms. Located just 2.5 miles from the Buffalo International Airport (complimentary airport shuttle service available) and moments from Exit 49 off of the Interstate 90, making us easily accessible to short and long distance travelers alike. Nearby attractions include: Niagara Falls, New Era Field, Key Bank Center, Shea’s Performing Art Center, Kleinhans Music Hall, Buffalo’s Outer Harbor, Universities, Buffalo Niagara Medical Campus, Frank Lloyd Wright’s Martin House, The Albright Knox Art Gallery, and more. 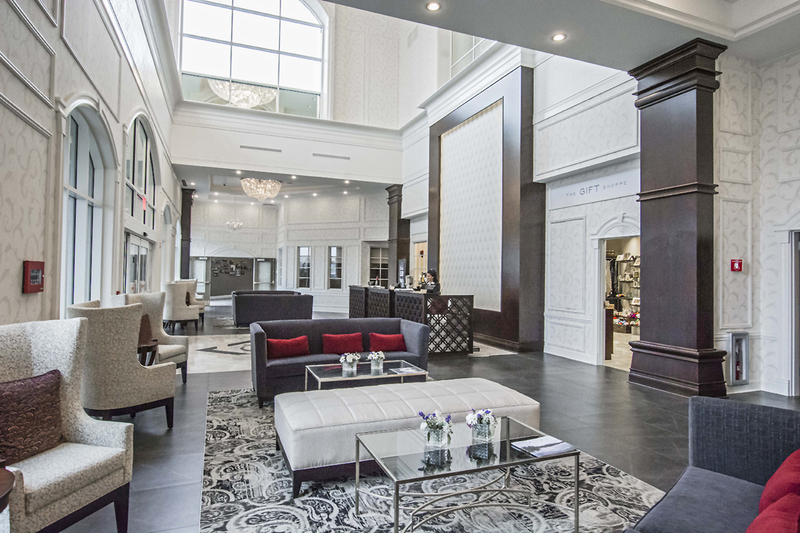 As you enter our spacious atrium reception area you will find a calm and inviting space. We welcome you to gather, and relax after a day of travel. A regulation pool table and comfortable seating await. Inspiring photo-mural headboards set a modern tone as you enter your boutique suite. Ultra-luxurious Latex Pranasleep mattresses are featured in many of our rooms. Our spacious designer bathrooms include hand selected granite, walk-in rain showers, jetted soaking tubs, and spa quality toiletries.